Ross, who is Creek, Cherokee, and Otoe-Missouri, is a senior political science major at Oklahoma City University. 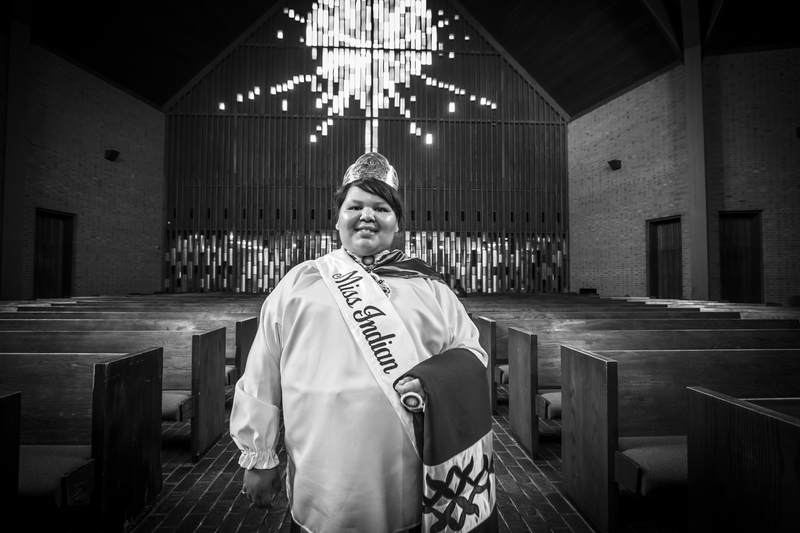 As the reigning Miss Indian OCU, she wants to use the platform to help women to embrace “audacity.” While the word may have negative connotations for some, she says it is powerful when women are bold enough to do something and follow their own dreams and desires. Ross believes this power starts with education and with helping Indian women gain perspective from and live with appreciation for the sacrifices others have made for them. She hopes traditional values can be reclaimed. “I’ve always been reminded that women were respected. They were asked for their advice. They made decisions in their clans and tribes. They had power.” She sees that today, women’s traditional values aren’t respected. JALISA ROSS (Creek, Cherokee, and Otoe-Missouri) is a senior majoring in political science at Oklahoma City University, where she is the reigning Miss Indian OCU. Jalisa was interviewed as a part of a joint project of the Indian Law Resource Center and the National Indigenous Women’s Resource Center to define Native love. The project focuses on raising awareness about violence against Native women and empowering Native people to speak out about traditional cultural values that honor and respect Native women.